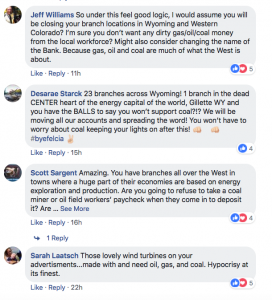 A San Francisco-based bank with branches in Colorado and Wyoming has decided it will no longer do business with any company linked with coal, natural gas or oil. Their haughty announcement is not going over well with customers. The manager and vice president of the branch in Craig has quit, Moffat County Commissioners will decide next week whether to close their account, and local residents are voicing their outrage on social media as well as intentions to do their business elsewhere. 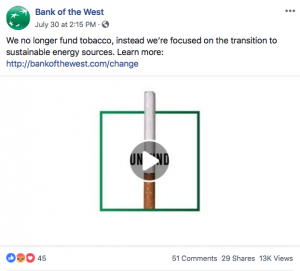 The Daily Press says the bank has since edited their message, and this awkward message is what we found along with more than 50 angry comments about the bank’s decision not to back coal, oil or gas. The post kept the link, and that’s where we found the message again telling customers to go pound sand, so long as it doesn’t contain oil. The bank shouldn’t be surprised at the backlash from customers. If the bank refuses to support a community, why should the community support the bank with its money? Craig is not a town to be messed with, either. Just ask New Belgium Brewery what happened to their business, and about 450 other organizations, after residents there boycotted them all for supporting an ecoterrorism group hell-bent on closing down the Colowyo Mine.